Bringing his remarkable storytelling gift to the events of Easter, Bob Hartman retells the events of Easter in a fresh and memorable way. Following the tried and tested formula of his earlier Lion Storyteller titles, Bob Hartman retells a selection of Easter stories in his own inimitable style. This collection of 23 stories includes the key Bible accounts of the events of the first Easter from Palm Sunday through to Jesus' resurrection, encounters with his friends and followers, and the ascension. Bob Hartman's retellings of familiar and sometimes serious tales are fresh and engaging, making these Bible stories accessible to the young and not-so-young. Line illustrations complement the text. As a bonus, this book includes some of Bob Hartman's favourite storytelling tips. 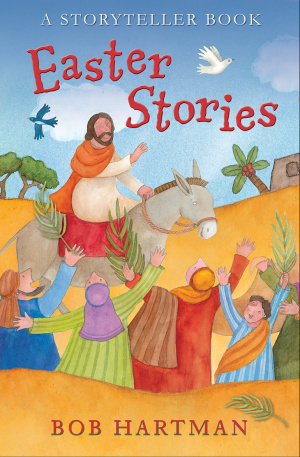 Easter Stories by Bob Hartman was published by Lion Hudson LTD in January 2019 and is our 1013th best seller. The ISBN for Easter Stories is 9780745978093. Be the first to review Easter Stories! Got a question? No problem! Just click here to ask us about Easter Stories.